The more obvious signs that indicate your automatic sprinkler system is in need of repair, might be that broken sprinkler head that the lawn mower ate last week. 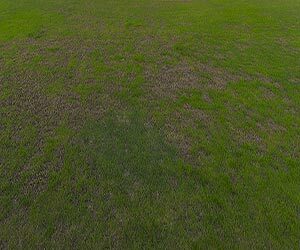 This is probably the most common amongst head breaks, but the less obvious are those caused by reclaim water, dirt and contaminates, poor design and inaccurate spray patterns due to maturing landscape. Listed below are just a few of the signs associated with a break or leak in your in ground sprinkler system. Brown spots in your landscaping. This means there is not water getting to this area of your lawn. Pooling water around heads. This probably means that the sprinkler head itself is defective and in need of repair. Wet, muddy areas of your lawn. If not near an actual head this could be a pipe break underground. Excess water on driveways and sidewalks. This is usually a sign of poor lawn irrigation system design and installation. Having a poor design will waste water on sidewalks, houses, driveways and everywhere else but your lawn. Detached sprinkler heads. As mentioned before, this is the most common scenario of sprinkler repair needed. 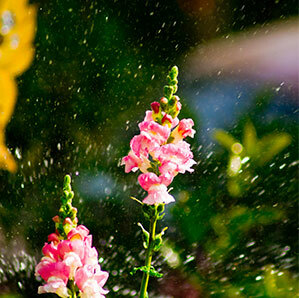 For any emergency or routine check-up, call Five Star Irrigation Services for your automatic sprinkler repair. All of these breaks and leaks are nothing new to Five Star Irrigation Services with 30 of experience. Our truck is completely equipped to handle any job no matter the size. We are here for your basic repairs of heads, valves, timer clocks and sprinkler head adjustments. We also have the experience and equipment to take on the bigger jobs, like having to revamp your entire lawn sprinkler system design. We have the tools to get the job done. Five Star Irrigation can redesign your sprinkler system diagram to adapt to your growing landscape. The original installation may not have accounted for how large some of the trees and shrubs can get, causing an interruption in coverage. We recommend a yearly check-up of your lawn irrigation system. 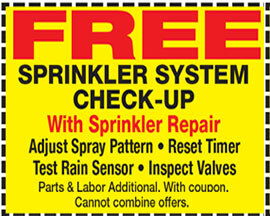 During this check-up, we will conduct a test of your sprinkler system and check for any leaks or signs of damage. 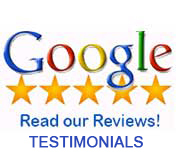 In the event you need a repair of any kind, we will gladly waive the check-up fee. We also use a higher quality of materials for all your sprinkler repairs and is better than what you can get at your local home improvement store. Our brand name materials are built to last. We also repair your lawn irrigation system with our parts and Labor guaranteed for a whole year!